Doreen Vaughan Boyce (b. 1934) and her family immigrated to Pittsburgh in 1962. Ms. Boyce began teaching economics at Chatham College in 1963 and served as Provost and Dean of Faculty from 1974-1980. Ms. Boyce earned a Ph.D. in education from the University of Pittsburgh in 1980) and served as President of the Buhl Foundation from 1982-2007, in Pittsburgh where she introduced information age technology to non-profit institutions. She was the first woman appointed to the Board of Directors at Duquesne Light and has since served on numerous corporate boards, including the board of Dollar Bank. Ms. Boyce’s great-aunt Doreen was a suffragette and an early role model, but Doreen did not become an advocate for women’s issues until much later when she discovered “we might have the vote, but that was all” (Boyce, 2008). She found Pittsburgh to have a very paternalistic culture with strong businesses and unions all dominated by men. When she became Dean at Chatham, she identified top women in major corporations and institutions because she “wanted to get to know them personally, to make friends with them on behalf of Chatham and to provide role models for students” (Boyce, 2008). Ms. Boyce was shocked to learn how few senior women there were outside of academia. In meeting with them, she learned that they did not know each other and that they were very lonely professionally. 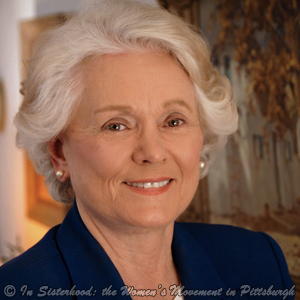 That prompted her to start the Executive Women’s Council (EWC) in 1975 to provide enrichment, support, and a source of collective influence for executive and professional women in Pittsburgh. After 30 years, EWC remains a unique organization providing leadership and facilitating opportunities to increase the political and economic power of executive and professional women.